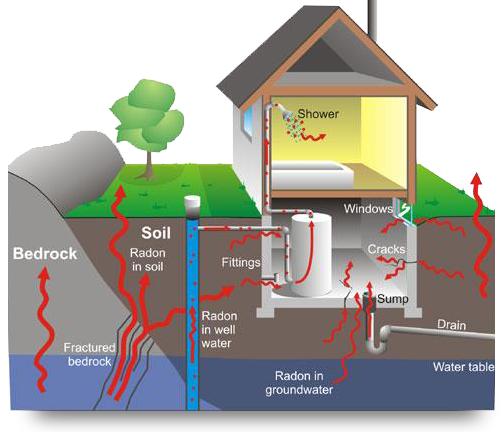 Radon is a naturally occurring radioactive gas that is present everywhere in our environment. It is created by the breakdown of uranium in soil, rock, and water. When radon is released into the outdoor environment it mixes with air and remains at a low risk level. It’s a different story when it enters an enclosed space such as your home. There it can reach levels of concentration that are of real concern. How do I Measure Radon Levels? Radon exists at varying levels in all homes. The typical environmental background levels in our area exist in the 8-16 bq/m3 range. In 2007 Canada dropped it’s “Action Level” from 800 bq/m3 to 200 bq/m3 in response to multiple 2005 research reports linking residential radon levels to lung cancer. European countries such as Britain and Germany have gone further and dropped their “Action Level” to 100 bq/m3. The World Health Organization recommends countries establish their “action levels” at 100 bq/m3. It is important to note the risk associated with elevated radon levels is completely linear, which means there is no “safe level.” Risk is a factor of time and levels to which one is exposed. To establish the level of radon in your home, measurement solutions are available. Learn about our Full Service Measurement. We strongly recommend purchasing your test kit through the Nova Scotia Lung Association. They offer a top quality alpha track test kit for $35 (including all lab fees) and will mail kits to any area of the province. This system allows tests of varying length to be performed. Applicable to most homes, a 91-day test can be performed under regular living conditions (no need to maintain closed house conditions) and is recognized by both Health Canada and the EPA as giving an accurate representation of average radon levels present in a home. 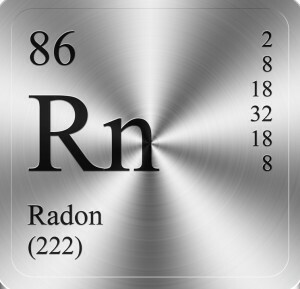 Radon is a known human “Class A” carcinogen. The gas and its decay products have been directly linked to lung cancer. Smokers or those exposed to second-hand smoke are at much greater risk. The only way to find out if your home has a radon problem is to measure the level inside it. For more information from Health Canada, please click here. What do I do if there are high levels of Radon Detected? If you have had your property tested and the report notes a recommendation to mitigate within a specified time, there are very effective options available. The most popular method of mitigation, ASD systems can be applied to slab-on-grade, full basement or crawl space construction. A properly designed and installed ASD system will not only mitigate radon levels, it will generally lower moisture levels as well. This helps with any existing mold/mildew issues and can even eliminate the need for the daily “emptying of the dehumidifier” so many of us go through in our maritime climate. Our objective for mitigation is to lower radon levels to below 100 bq/m3. We use only Schedule 40 PVC in our systems for strength and weather resistance. ASD systems include diagnostics prior to install and pre/post-install radon testing with a continuous radon monitor. For more info on ASD systems, please click on one of the images to the left. Another method of reducing radon levels is by dilution. Exhausting stale interior air while bringing in fresh air dilutes radon. As the half-life of radon is 3.8 days, there is a good chance it can be exhausted before it decays down to the more dangerous poloniums. While this method is generally not as effective as Active Soil Depressurization, it can be suitable for those wishing to lower levels slightly. As more families try to maximize their living spaces, more time is spent in our basements. With the drive for energy efficiency sealing up buildings and homes, your can create an environment with little or no air movement. Installation of an HRV system makes sense in any home as the benefit of constant fresh air creates a healthier environment. HRV systems should be balanced and maintained on a regular schedule. An unbalanced system can result in interior depressurization, drawing radon and other soil gasses into the home. We offer specification, design, installation and maintenance of HRV systems to help mitigate indoor pollutants.